Nervous about the dichotomy between buying nice-to-have things for your kids and making sure your they learn what it means to earn their own way? Welcome to the 50/50 rule. When your kids want a _____ (insert seemingly important item that fits the “want” category rather than the “need” category), tell them that you’ll split the cost 50/50 with them. Then immediately be ready to offer ways to make money with chores if they ask. If they really want the item, they will do whatever it takes to get it. 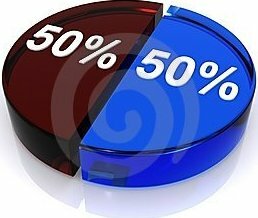 And with the 50/50 split it’s amazing how often their 50% share is reasonably within reach if they will put in some effort to work for the money. And if they come to you with an idea to sell homemade banana bread every weekend morning door-to-door in your neighborhood, you have the side benefit of knowing you’ve given birth to an entrepreneur. I personally love the 50/50 rule and have evidence to prove that it’s worked exactly as I expected/hoped using my two college graduates as test cases. It works for $10 wishes when the kids are in elementary school and extends to $200 wishes when they are in high school. I’m even considering 50/50 matching on IRA contributions for the first 3 years of my girls’ working career to stress the importance of starting retirement savings as early as possible.